To some, the Drakensberg creates images of dragons, to others the jagged basalt pinnacles look like a barrier of spears. The Zulus call it Ukhahlamba, the barrier of spears. For me, casting my eyes upon this majestic range is breathtaking and beyond adequate description. 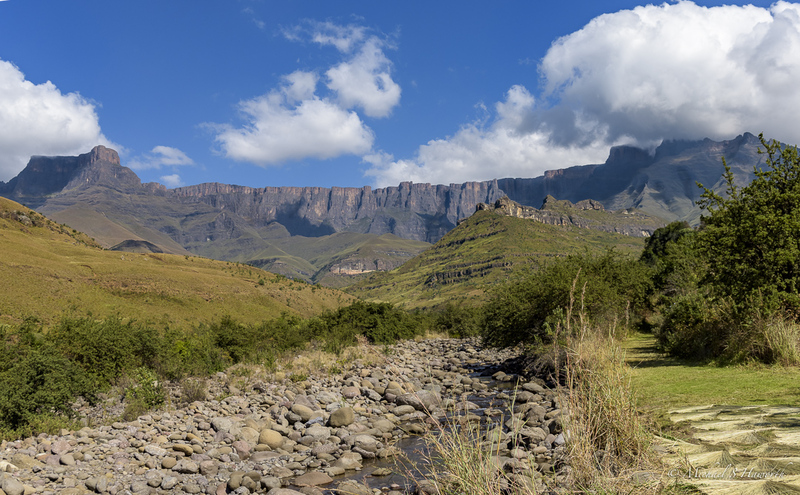 The Drakensberg mountain range stretches about 1,000 kilometres from the Blyde River area in Mpumalanga near Kruger Park to the interior of the Eastern Cape, forming the edge of the interior plateau called the Highveld. The mountains and surrounding wilderness area in the foothills have been declared an UNESCO World Heritage Site. This site constitutes some 240,000 hectares under the control of KwaZulu Natal Wildlife. This mountain range provides great biodiversity and is home to an extensive insitu exhibition of Bushman rock art. 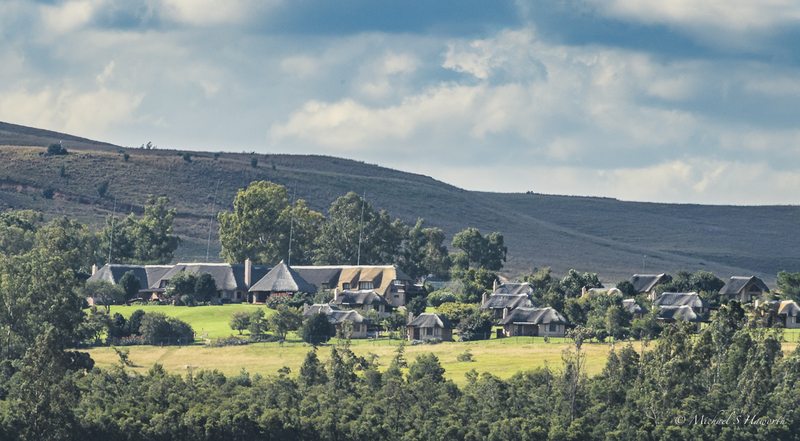 The next image is of Montusi Mountain Lodge, a very comfortable well-appointed family lodge. We spent four wonderful days at this lodge and used it as a base from which to venture to the surrounding mountain areas. After breakfast, this was the vista looking out from our suite. That feeling of wide open space enables you to breath deeply and a feeling which soothes your soul. 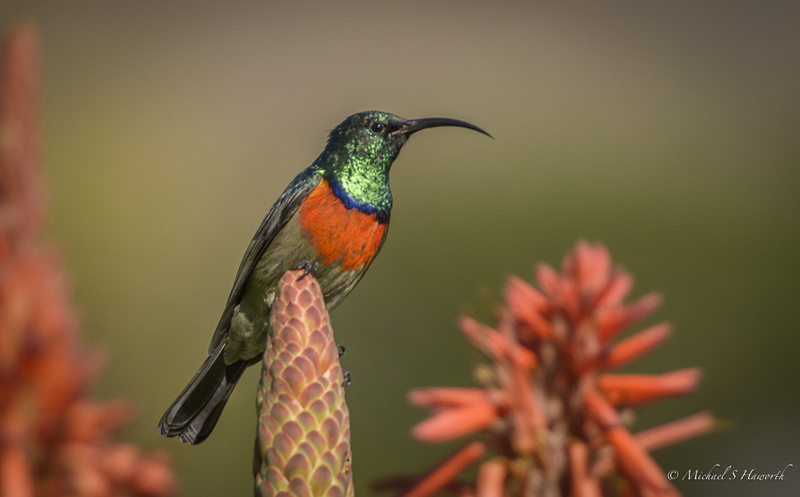 While the huge vistas allow you to look far, there is much activity right in front of you in the form of sunbirds on the aloes. 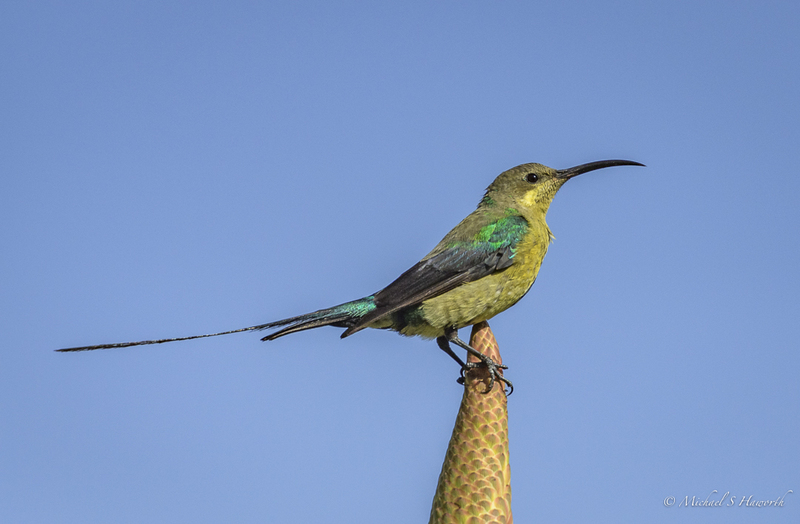 Malachite and Greater double-collared sunbirds in particular seem to prefer the higher altitudes. Although it was mid-May, late autumn in South Africa, it was not cold. 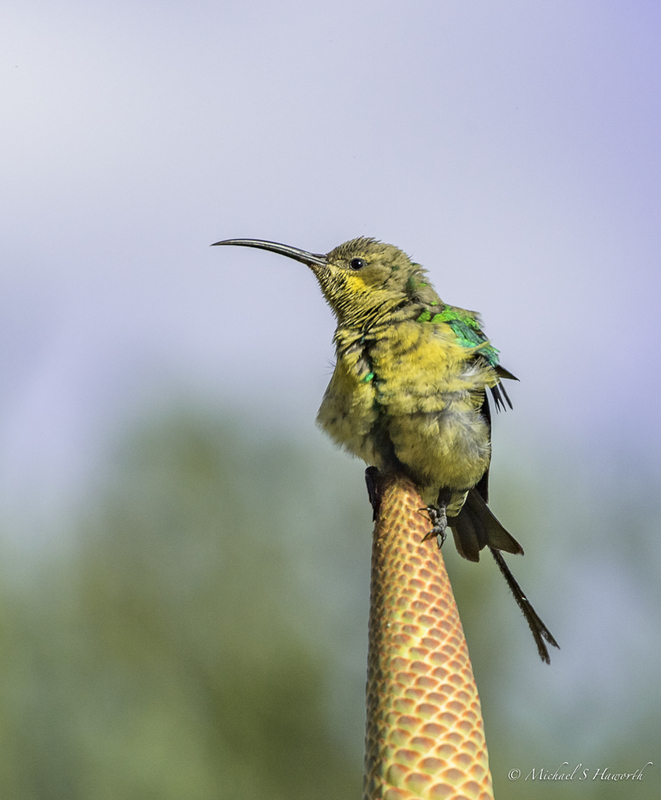 This male Malachite sunbird was just ruffling his feathers as a sign of relaxation. 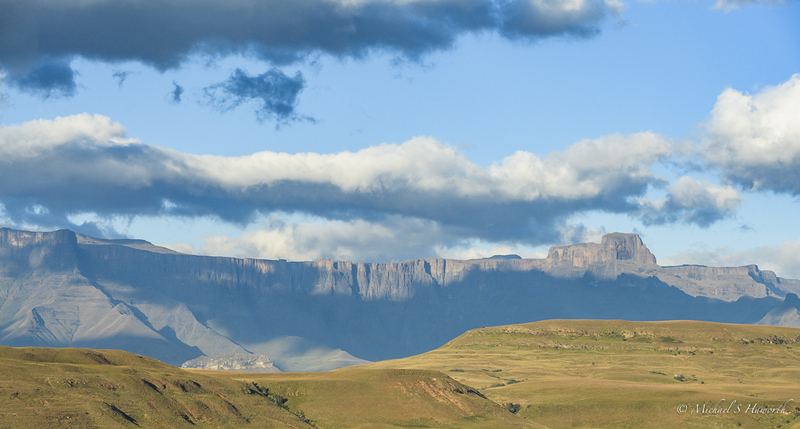 The huge and dramatic vistas in the Drakensberg are the result of its geology. 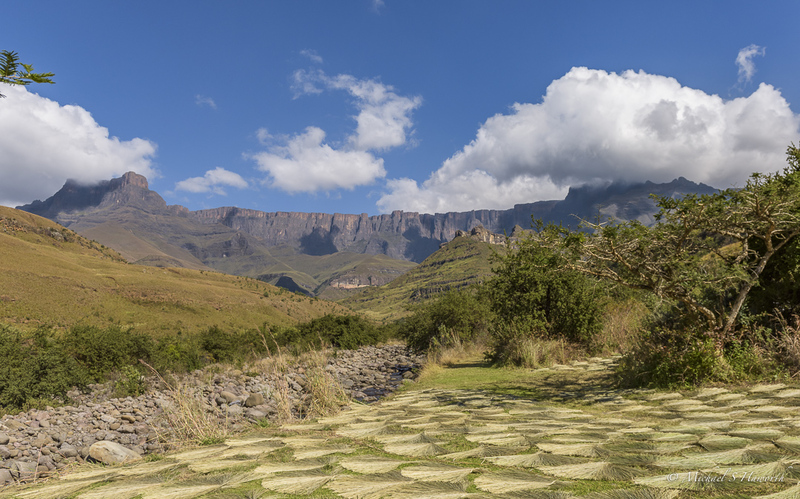 The geological formation of the Drakensberg has taken place over many hundreds of millions of years. The final stage of which began some 190 million years ago and is still underway. For millions of years, sediment, in the form of layers of clay and sand, were deposited. These layers are known as the Molteno Beds, Red Beds and Cave Sandstone (from bottom to top). These sediment beds were pierced by volcanic Dolerite intrusions. The Dolerite is far harder than the sedimentary layers and so is less prone to erosion. 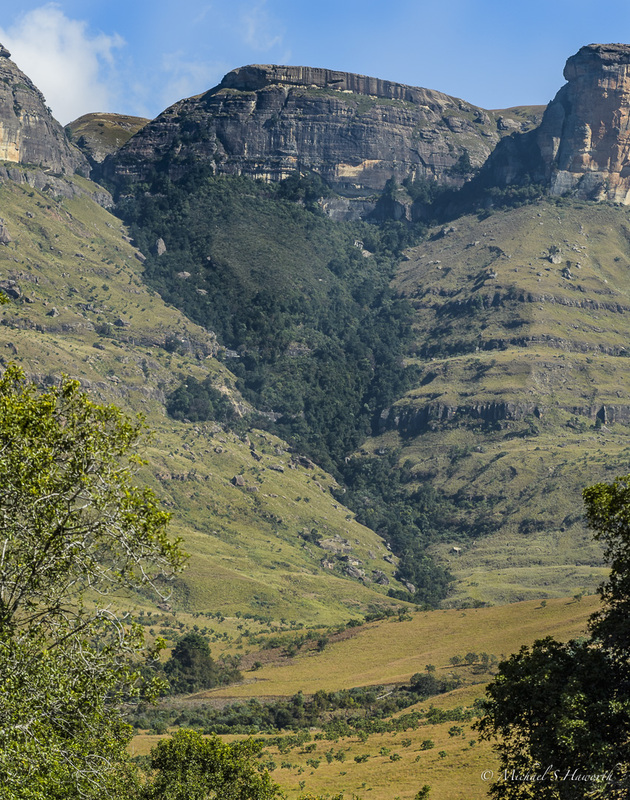 This has resulted in the dramatic sheer cliffs, buttresses and pinnacles which are so characteristic of the Drakensberg. Gondwanaland began to break up into different continents around 180 million years ago, during the Jurassic period. About 160 million years ago, enormous volcanic activity created major lava flows which covered the sedimentary layers. These lava flows are thought to have originated from the area which is present day Lesotho. Some of these larva flows reached thicknesses of up to 1300 metres and slowly made their way to the present coastline about 200 kilometres to the south-east. These so-called Stormberg Basalts have been eroded over time through wind and weather and form the what is called the High Berg. This process of erosion also accounts for the flat-topped plateaus rather than peaked mountains top of the Drakensberg. 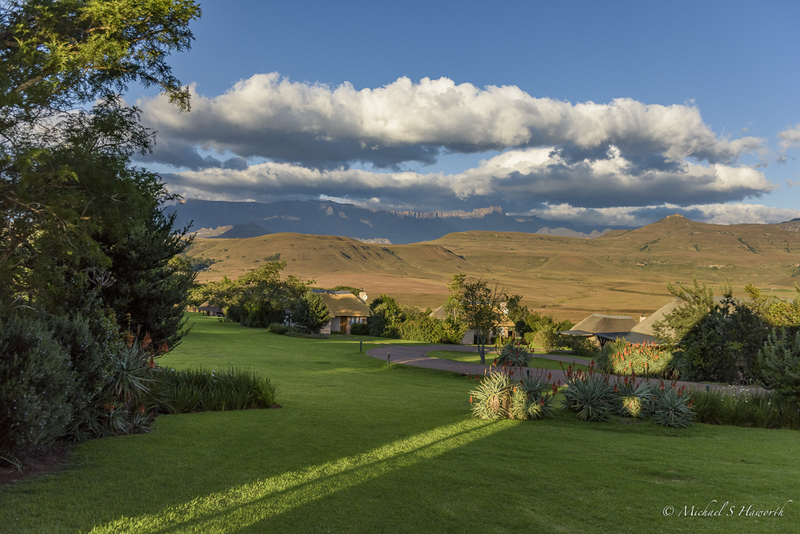 The Amphitheatre is not only one of the most spectacular landmarks in the Drakensberg, but also in Southern Africa. It is also relatively accessible from both top and bottom. 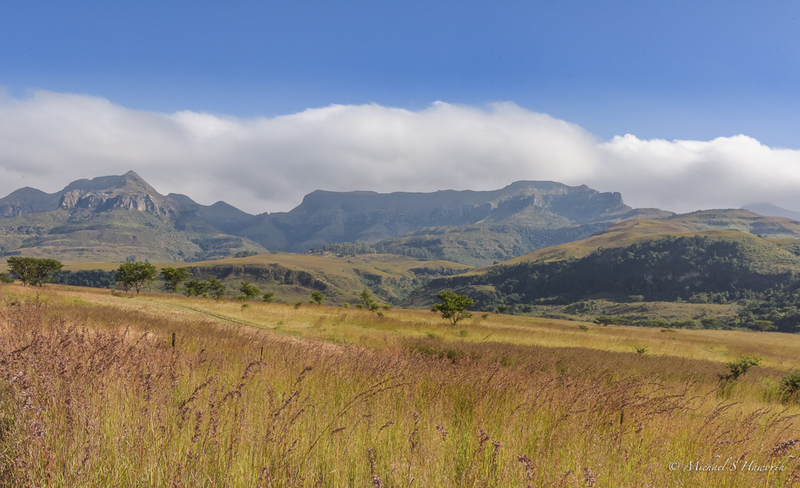 This area has been preserved as part of the Ukhahlamba Drakensberg Park, which is now known as Royal Natal Nature Reserve. The Montusi Mountain Lodge is located opposite the Amphitheatre about 15 kilometres from the sheer rock wall. The Amphitheatre is characterised by a massive semi-circular wall of basalt with cliff faces over 1,200 metres high in places. This is a seven kilometre wide semi-circular rugged wall of basalt rock which rises over 1,000 metres from the hilly terrain of the ‘lower berg’. The top of the Amphitheatre is a flat plateau that now forms the watershed of Southern Africa. In 1836, it inspired the French missionaries Arbousset and Dumas to call its highest point the Mont-aux-Sources, the “Mountain of Sources”. 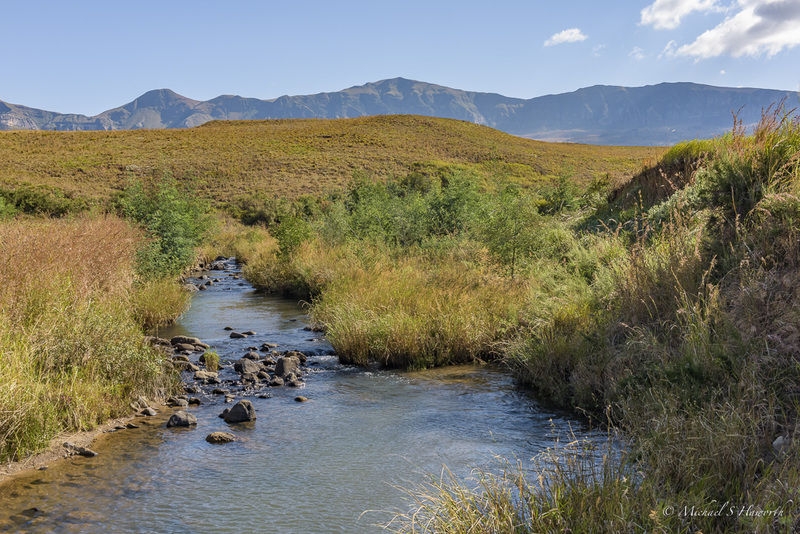 Several rivers originate here, the most famous being the Tugela River. 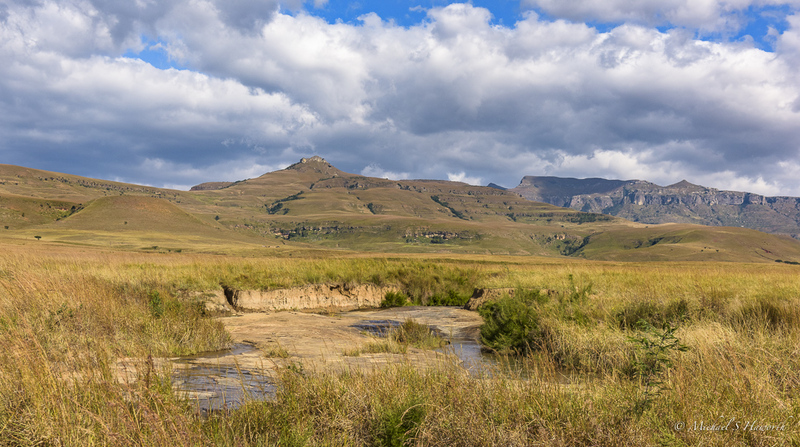 Before the first lavas began to flow in the area of the present-day Drakensberg mountain range, the place was part of a shallow depression fed by inland waterways. It was an enormous inland lake. Its waters covered the ancient land mass called Gondwanaland. The sediments carried into the lake were deposited on granite foundations which had formed almost three billion years ago. This super-continent Gondwanaland included Africa, Australia, New Zealand, South America and Antarctica. With a sense of its geological history, we drove into the Royal Natal National Park which is at the foot of the Amphitheatre. it was like driving into a natural museum. The next image was taken around mid-morning just before the Tendele camp car park. The rocky river bed of the Tugela river runs down the left hand side of the image. In the foreground are fans of thatching grass laid out to dry by the local people. They use the thatching grass for roofing material. A short distance from its source on the plateau, the Tugela plunges 850 metres over the edge of the Amphitheatre in five distinct drops, making it the second highest waterfall in the world. Being late autumn there was little water in the Tugela river. It must be impressive when the snow melts on top of the mountains. Over the millennia this river has created a magnificent gorge with numerous waterfalls, caves, shaded forests and rock tunnels. For hundreds of years this wild fertile area was home to the Bushmen and their many rock paintings are testimony to their unobtrusive presence. On our last morning, I awoke before sunrise and as the sun rose it cast a magical orange-pink hue over the vast landscape. So many landscape photographers tell you that the light adds that magical touch to wonderful vistas and this was a good example of that truth. Later in the morning the colour of the light had changed completely. Around the Montusi Mountain Lodge were numerous clusters of candelabra aloes erupting with inflorescences of vivid orange-red flowers. 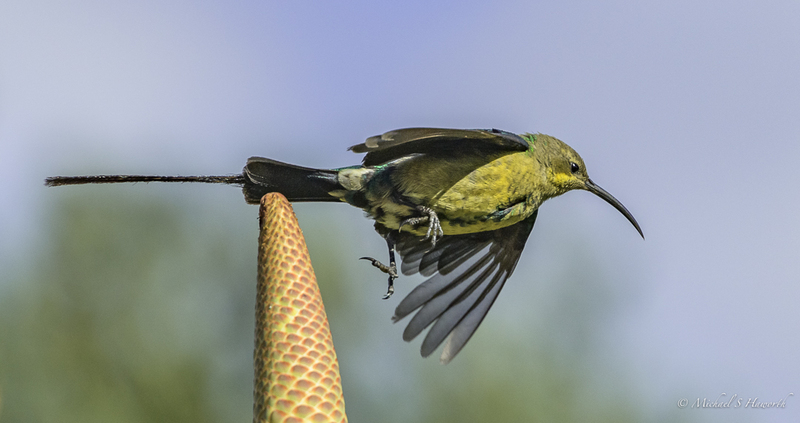 In the mountains where there are flowers, there is nectar, and where there is nectar, there are sunbirds and sugarbirds. 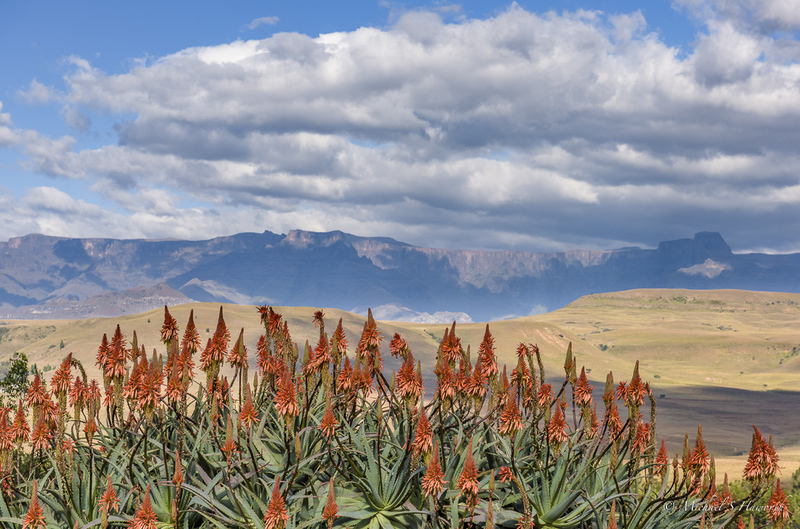 A typical candelabra aloe cluster in the foreground with the Drakensberg in the distance. On the road out from Montusi you cross numerous mountain streams. This was one, flowing with crystal clear water. One of our last vistas as we drove out of the northern Drakensberg. Looking at it gives you a sense of peace and permanence. Explore, seek to understand, marvel at its inter-connectedness and let its be. During the 1970s we used to hike in the Drakensberg foothills or along the top almost every weekend. My husband published a field guide – after we had done a LOT of footslogging. Most vigorous and enjoyable research ever!